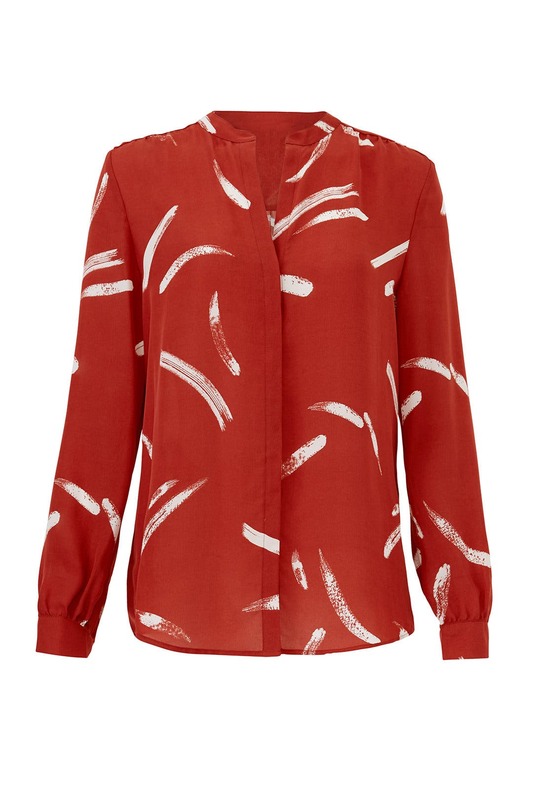 Painterly brushstrokes decorate this button-down Joie shirt that makes styling easy. Red printed silk (100% Silk). Top. Long sleeves. V-neckline. Hidden front button down placket. 28" from shoulder to hemline. Imported. The fit is great. The color is a brick red. Light enough to wear in early fall, and thin enough to layer under a blazer. Would totally rent again!!! Great shirt. I wish the color was more brilliant. It was a bit more rusty red than I thought. 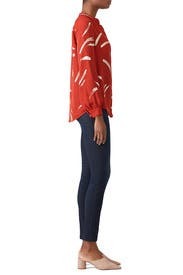 Possibly could have done one size smaller in this blouse but loved the style, the shape and the color. Normally wouldn't purchase a silk blouse so it was nice to give one a go! Enjoyed wearing this to work. A beautiful, fall red and looks cute with jeans. The material was more cotton than I expected so felt more casual. It was cute and comfy though. Easy blouse that dresses up a pair of jeans or looks great with a skirt or dress pants as well. Loved the color for fall. Runs true to size. Much lower cut than appears in the photo. Much lower cut than appears in the photo. I wore it with a tank underneath for a nice dinner out. Nice material that would be a bit clingy without a tank underneath. Got a ton of compliments on this top! I liked the loose fit of the top. The color wasn't as bright as I expected from the rtr picture. Once on it had a bit of a throwback vibe. Not bad tho. The top is very light and lower cut than I expected so I wore a tank underneath. Nice blouse but not really 3rd trimester bump friendly. Easy with black pants for work and then out with friends. Glad I sized down! Am usually a medium but the small was great. I wore it for work and it was great! A little large for me but still like it. Solid blouse for work. Sleeves were exact length (sometimes I find blouses can have short sleeves). Would rent again. The bold color and fun pattern was a nice change of pace for a fairly standard work uniform. The fit felt true to size. Loved the shirt. 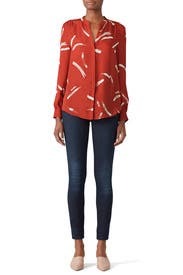 I rented this to wear for family photos and it was advertised as good for "weekends"
The color is beautiful, I felt this shirt was probably better suited for a "work" outfit shirt rather than a weekend "fun" outfit. I didn't end up wearing the shirt. Nice length. Paired well with leather jacket. Super versatile and the perfect blouse to wear under my black suit. Loved the paprika color. The shirt is a little thin, so it may be a bit cold to wear in the winter. It seemed to run a little large. This top is very nice quality and was the perfect work top. I wore it with dark jeans and got a lot of compliments. It fits well and I tucked it in on one side, which made a really cute statement. I would definitely wear this more than once if the weather was a little cooler. 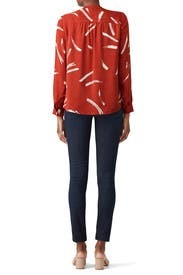 Love this top for fall! It was loose and comfortable. It's cute and versatile but I'm not sure why it's priced that high. It's nice but basic. It worked well for a causal night out. It reminded me of shirts I already own, so it was nice having something similar to my other clothing, but I wouldn't rent if you want something trendy or that you want to stand out as interesting. Beautiful and different. I'm not a pattern person, but I love this "brushstroke" look. I teamed it with a Tory Burch navy skirt. Very classic and classy. If this was not still $194 to buy - I would buy it!! Great fit, great fabric - awesome top! This was a little snug in the chest for me, so I was unable to wear. I'm still sorting out sizing with RTR, so I think this was a function of my size choice more than fit not being as described. That said, it was a pretty blouse, and the hidden buttons in the front were a nice touch. It wasn't so great that I'll be reordering in another size to wear, though. 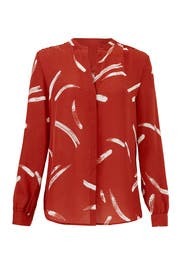 This is a very pretty blouse that can be work or casual-appropriate. Mine arrived with 3 stains on it, which was a bummer- I won't be wearing it to work. Will probably do one casual wear and then return. 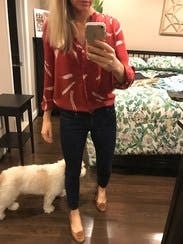 love the relaxed fit of this blouse. fit was as described and perfect for work. This top was gorgeous. I wore it to work and got a ton of compliments on it from everyone. Will definitely rent this one again. I tend to wear my sleeves rolled up but since this top is silk that wasn't really possible, but other than that this is one of my favorites. I wore this top three times, twice with jeans and once with dress pants for work. The top was super comfortable and fit really well. I did wear a cami underneath since it does fit a little loose. Great flowy fit for 2nd trimester. Very cute with skinny jeans. Great for day to day- can wear to work with a skirt or just pair with a pair of jeans. Good length. Material is thin- not in a bad way, but wouldn't wear without a sweater in cold weather. 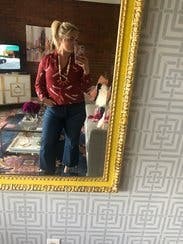 Loved this blouse, I wore it multiple times. 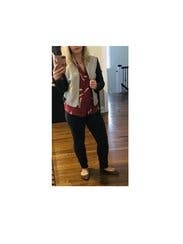 Not super exciting, but easy to wear, particularly to work under a blazer.